Original map by Cambridge University Press. For Le Bourreau, I have the benefit of writing about locations that actually exist even 200 or so years later. The city of light and love retains a lot from the 18th century (and other eras). 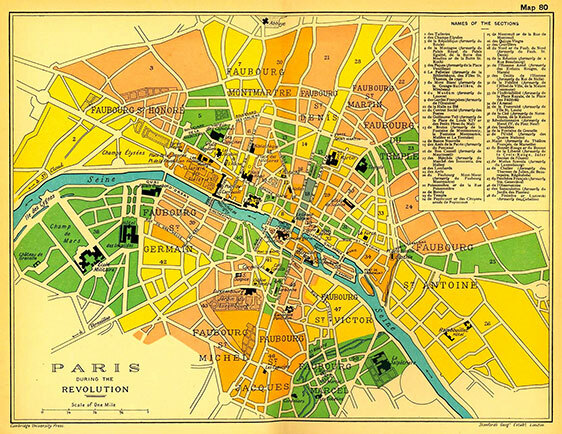 Comparing today’s maps with those of Revolutionary Paris, can be misleading but pinpoint the right landmarks and you’ll find many of the streets in common. My last trip to Paris had as a goal, in part, visiting the locations that figured in the real life events of the Revolution and the lives of the people who inspired my characters. I found in memoirs and other documents, frequented locations, routes traveled, and even home addresses. I collected pictures, images, paintings, maps, and accounts of the way it was; taping them to my windows where I write at home and using them to guide my trip planning. Many of the more popular destinations I’d visited on previous visits, but even some of those were on my checklist so I could look at them through the eyes of a writer. In hindsight, I ought to have made better use of the trip. Some locations and visiting hours got left at home and I found it more important to show my Mother—my travel companion and a Paris first-timer—the city than separate from her or drag her along too many execution routes. I’m very comfortable in my knowledge and familiarity of the city sufficient to be accurate, it’s the atmosphere I wish I could soak in. I do not regret the family time, I’d just like another trip! As a reader, if a map accompanies the book I’m reading, I rarely study it or return to it while reading. I used to all but memorize the map and dog-ear the page so I could find it again. I’m not sure what changed. As a writer however, as I map key locations in Paris, my plot and subplots start to crystallize and give life to the story. And this understanding of the city, the relation of place to place, and the work conveying how Paris affects one’s senses, are gaining positive commentary from my writing group and other early draft readers. My little Michelin Paris guide is now peppered with flags indicating the home neighborhoods of my characters and more. I now realize that for me, just as the idea of a character can spark an entire saga in my mind, a great setting has the same power. Several other story ideas were born of a place and time, character and plot coming later. One of my writing friends developed her plot first, coming to character and setting afterward. In her case, the story setting is a fictional Midwest town. She grew up in the area so she has a good sense of place but for the town itself, she’s referred to a map of an actual town to inspire the layout of her setting. How do you tackle settings you are unable to visit in person? This entry was tagged atmosphere, inspiration, map, my book, my novel, Paris, senses, setting, story starter, writing. Bookmark the permalink.